SAMARITAN’S PURSE IS COORDINATING LIFESAVING HEART SURGERIES FOR KIDS IN MONGOLIA AND OTHER COUNTRIES WHERE THESE PROCEDURES WOULD NOT BE POSSIBLE. In a remote province in Mongolia about 140 miles from the capital city, a young mother and father work tirelessly day in and day out tending to their sheep, goats, cows and horses. As nomadic herders, they move with the changing seasons and make their home in different areas throughout the mountainous countryside. Yet, no matter how much Adiyaa and his wife Myadagaa worked to provide for their three children, and no matter how deeply they loved them, they found themselves helpless to do anything to save their youngest daughter’s life. 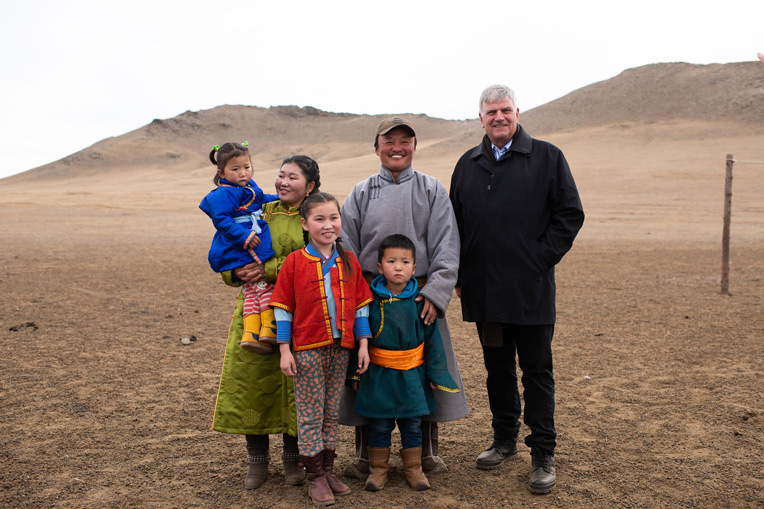 Franklin Graham stands with Ulzii’s family in the grasslands of Mongolia’s Tuv Province. Ulzii (far left) is held by her mother Myadagaa and father Adiyaa, as her sister Tumee and brother Tulgaa stand by. Ulzii, now 4 years old, was born with a hole in her heart and would not live long without surgery. Her parents’ anguish escalated when they learned that the procedure could not be performed anywhere in Mongolia. Circumstances took a radical turn for the better, when the family connected with Samaritan’s Purse. 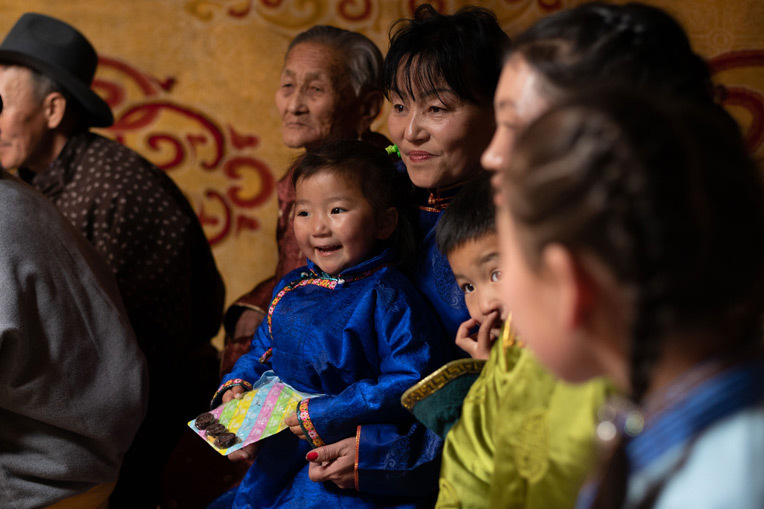 Ulzii’s story of how God used our Children’s Heart Project to bring her lifesaving surgery is just one of many that Samaritan’s Purse President Franklin Graham heard during his recent visit to Mongolia. During the past 21 years, Children’s Heart Project has brought lifesaving heart surgery to more than 1,280 children from countries that do not have the medical facilities or expertise to perform such complex procedures. Samaritan’s Purse transports the sick child along with a parent or guardian to North America—where they stay with a Christian host family—and then undergo an operation donated by a local hospital. Children’s Heart Project beneficiary, Ulzii, sits with her grandmother during a gathering with Franklin Graham. When Graham visited Ulzii’s home, her parents and extended family enjoyed providing him a taste of their unique lifestyle. They invited Graham into their ‘ger’—a traditional nomadic home that’s round, portable and easy to assemble—for milk tea and dumplings. Children in the village participated in a horse race, and then the family demonstrated how they milk the goats. They also thanked Graham and Samaritan’s Purse for making Ulzii’s surgery possible. 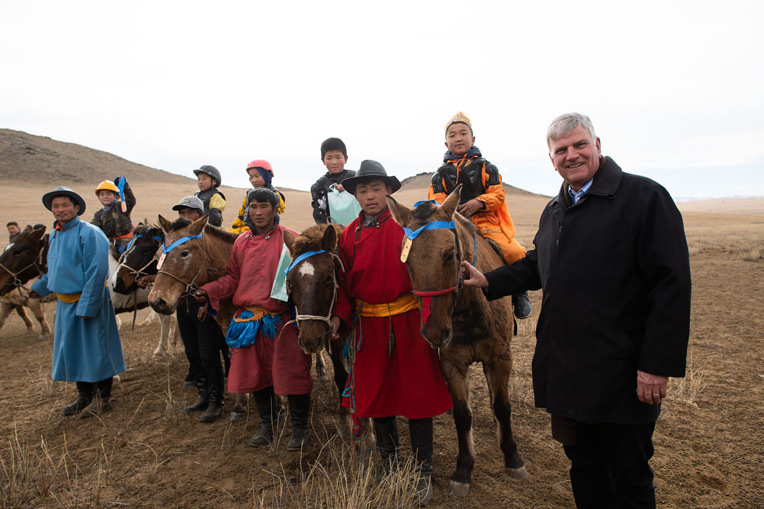 Franklin Graham meets with young horsemen following their race. During his visit, Graham also shared the Gospel and prayed with the family. When Myadagaa heard the devastating news about Ulzii’s health she knew it was unlikely that she would see her precious daughter grow up—and that nearly broke the tender, loving mother’s heart. Children’s Heart Project beneficiaries gathered to celebrate what God has accomplished through the programme. Ulzii cried a lot as a baby, had difficulty gaining weight and was often sick. Her parents knew something wasn’t right and took her to a hospital in Ulaanbaatar, the capital city. The hospital referred the family to Samaritan’s Purse, and when Ulzii was about 1.5 years old, we helped her receive the surgery that would save her life. Samaritan’s Purse provided transportation for Ulzii, her mother and an interpreter to Grand Cayman and coordinated with a partner hospital and surgeons who donated their services. We also arranged a host family for Ulzii and Myadagaa that cared for them while they were thousands of miles away from home. 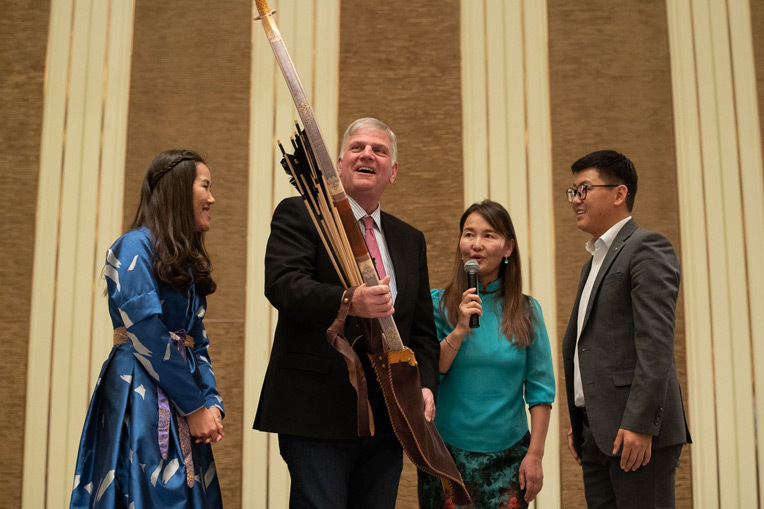 Franklin Graham is presented with a gift of a Mongolian bow and arrows at a special celebration for the Children’s Heart Project. Ulzii wasn’t the only one who experienced dramatic life change in Grand Cayman. As Myadagga interacted with our staff she learned about God and the Bible. Although Myadagaa does not know any other Christians in her remote province, she is committed to drawing near to her Saviour. 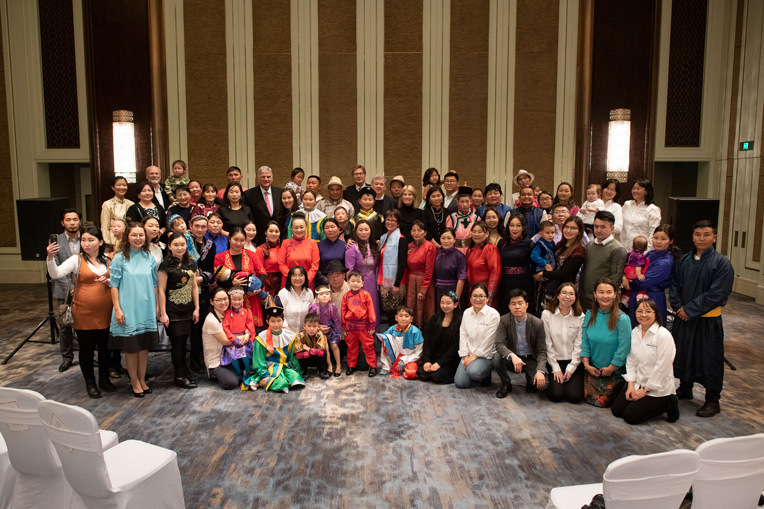 Graham also attended a special dinner and program in Mongolia with Children’s Heart Project beneficiaries and their families. The children entertained with traditional Mongolian songs and dances, and Graham brought words of encouragement. He shared from the Bible about how Jesus and His disciples were once caught in the middle of a terrible storm. Jesus’ disciples feared for their lives until Jesus rebuked the wind and waves. “When you saw your child sick, you were going through a storm in life. Maybe some of you felt you were running out of hope,” Graham said to the children’s parents. 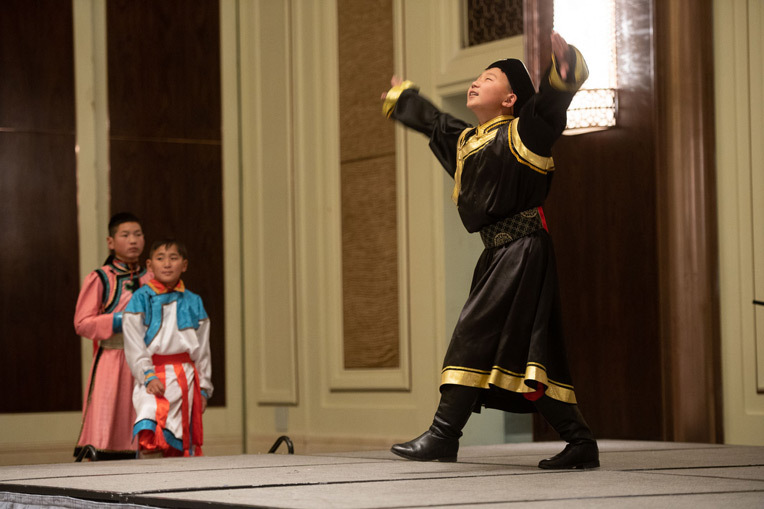 Deggie, 14, danced a traditional Mongolian dance at the ceremony. He had surgery at Mayo Clinic when he was 3 years old and then became a Christian at age 7 when he attended our Heart Camp. Graham also heard a testimony from Bat-Ulzii, the discipleship pastor at a church in Ulaanbaatar. Bat-Ulzii received heart surgery through Children’s Heart Project in 2006 in San Antonio, Texas, when he was 13 years old. Bat-Ulzii came from a Buddhist family, and he heard the Gospel for the first time ever through the work of Samaritan’s Purse. “I opened my heart and accepted God as my Saviour. I used to think that I only needed heart surgery, but I realised there is a big hole in our souls that needs to be filled. God is the one who fills the hole,” he said. Bat-Ulzii is now married and has two children. His life is fully committed to sharing the Gospel and to glorifying Jesus. 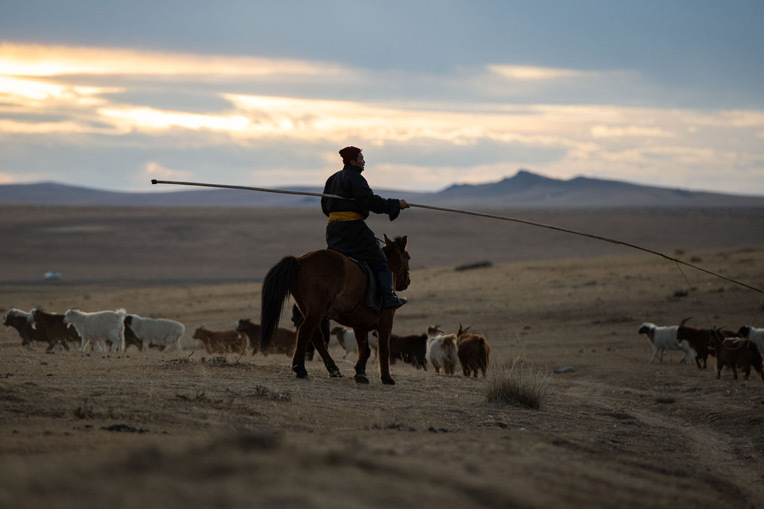 Horsemen are a common sight on the grasslands of Mongolia’s Tuv Province. Today, you can give the precious gift to mend a heart that will make it possible for a child to have the lifesaving surgery they desperately need and also hear about the life changing love of Jesus. You can even give this gift in honour of a loved one and we will send them a card notifying them.